Using off-peak awards with American Airlines is one of the best ways to make your AAdvantage miles go further. If you don’t mind traveling off-season, they offer exceptional savings on flights to Europe and South America. Here are some of the places you can go and the dates when off-peak rates kick in. 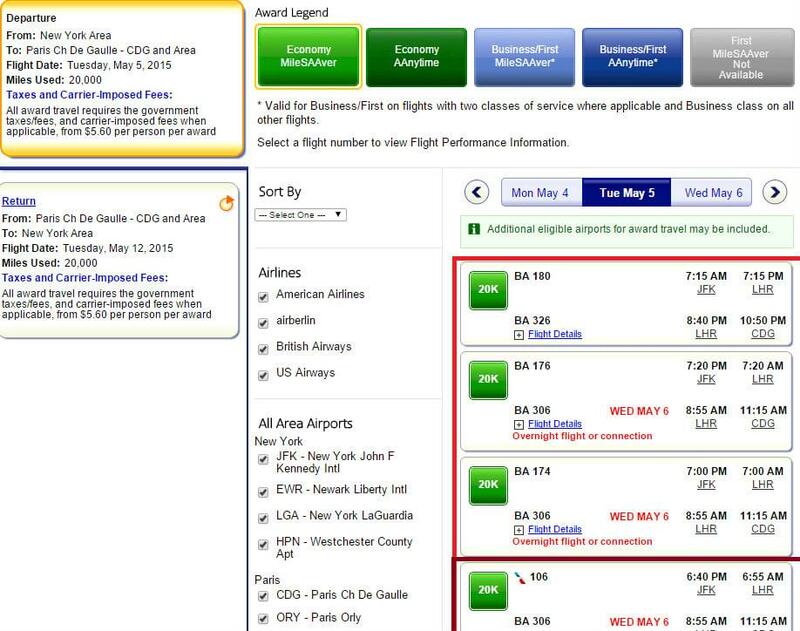 These are one-way costs for off-peak and regular flights and the price difference in miles. 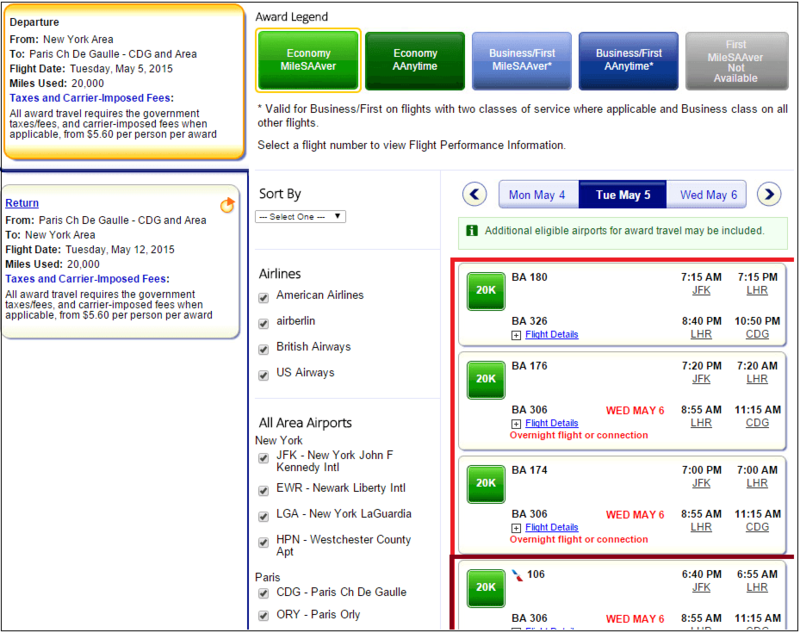 American Airlines does not have off-peak redemption rates for business or first class seats. You get the best off-peak value with American Airlines on flights to Europe and southern South America: Argentina, Bolivia, Brazil, Chile, Paraguay and Uruguay. By traveling off-peak, you save a whopping 20,000 miles off of the regular 60,000 mile redemption rate for a round-trip flight. Some destinations are harder to find availability for than others, but in general American Airlines off-peak award availability is pretty good as they have many alliance partners that fly to these destinations. If you have a Citibank AAdvantage credit card or elite status with American you may be offered even more flight choices. You will need to sort through the options, though, to stretch your travel budget by avoiding or reducing airport taxes and fuel surcharges. 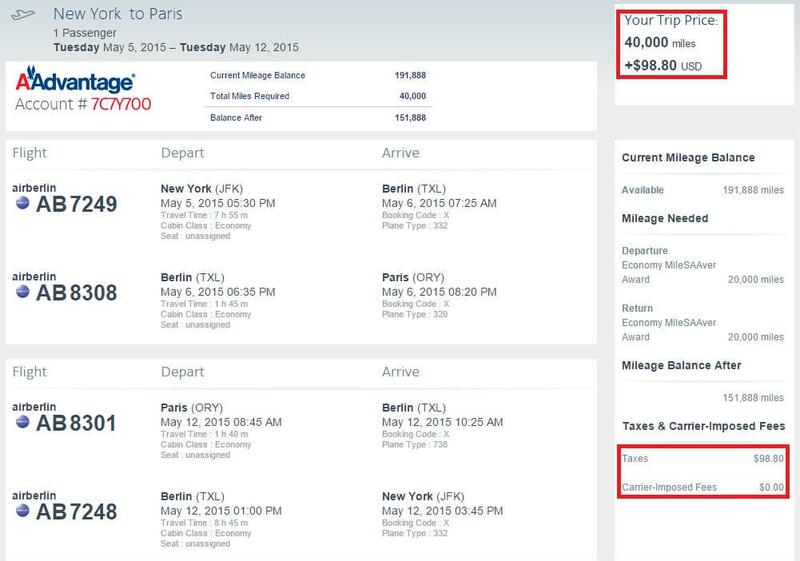 We have used a New York to Paris route as an example of how to reduce out-of-pocket costs on award tickets by choosing the right airline and airport. 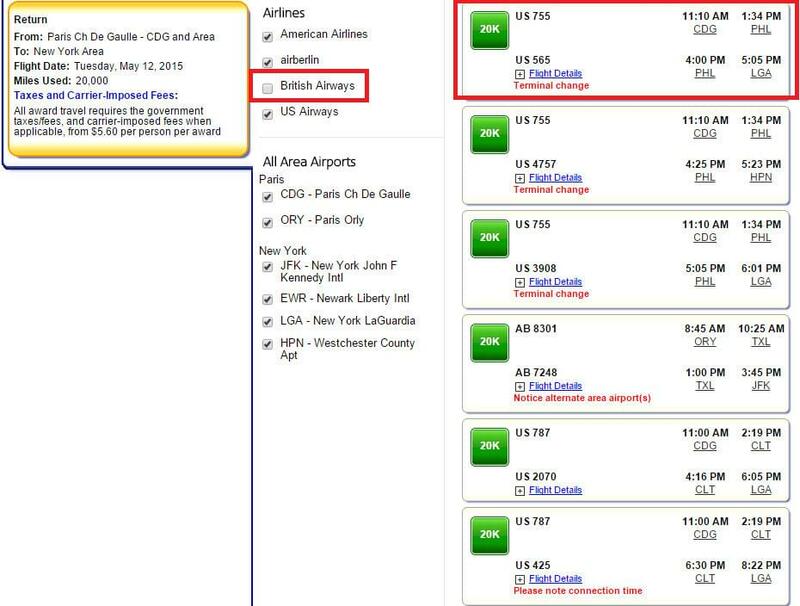 Typically, British Airways is not the best choice for a transatlantic flight because they apply huge fuel surcharges. In this case, the award ticket costs over $700. 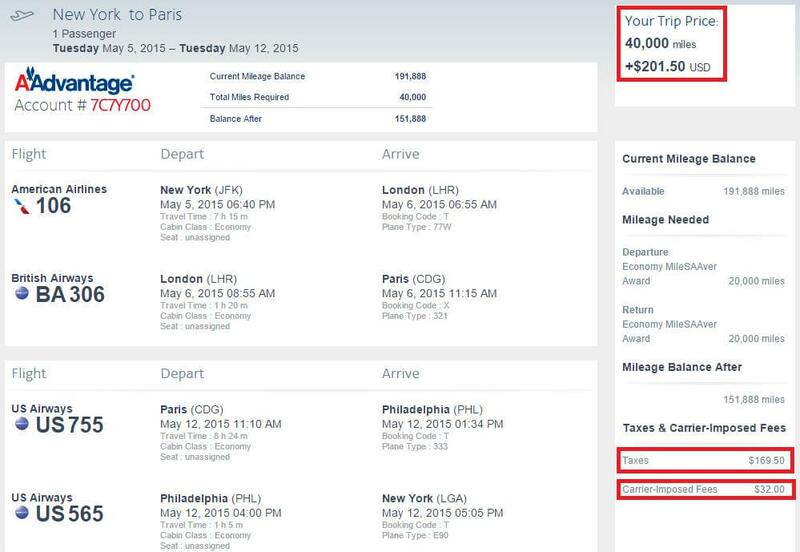 But if you book your transatlantic flight from New York to London on American Airlines, and then take British Airways to Paris, it will dramatically reduce the fuel surcharges. The same trick won’t work in reverse, though. There’s a $200 fee to depart from Heathrow Airport, which is where one of American’s biggest European partners, British Airways, routes most of its flights through. 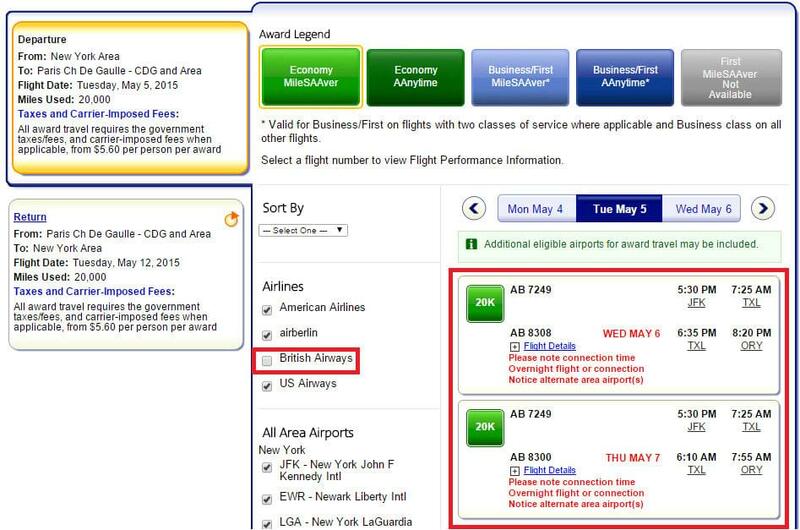 You can avoid British Airways altogether by removing it from the list of airlines to search. 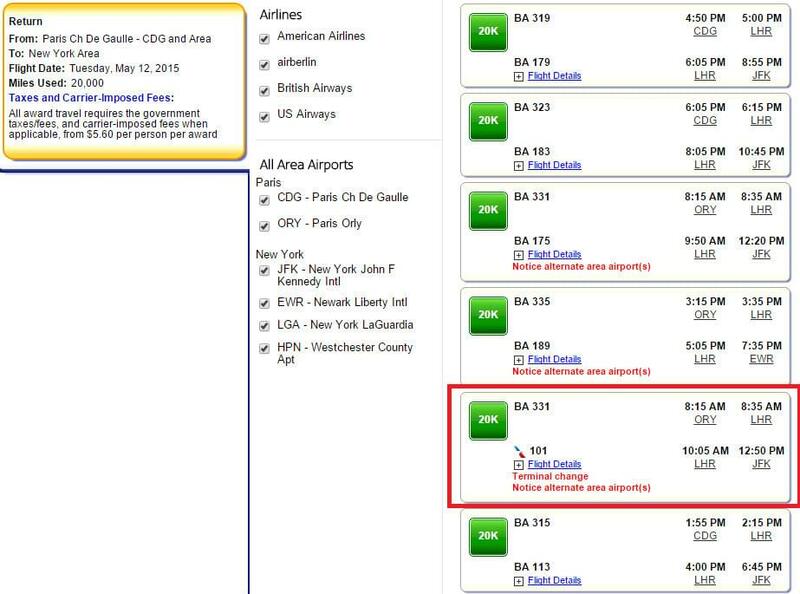 Then other options like this flight on US Airways from Paris to New York’s LaGuardia via Philadelphia will come up and since it is not routing through Heathrow you can avoid that hefty airport tax. Charles de Gaulle Airport also charges taxes on departures, but they aren’t as bad as Heathrow’s. The $32 carrier-imposed fee on this page is British Airways’ fuel surcharges. But you can bring down your costs even more. You just need to find an airline without any fuel surcharges and airports with lower taxes, which means you might want to avoid British Airways and Charles De Gaulle altogether. One adventurous option is using AirBerlin. It is an American Airlines oneworld partner, and it flies out of Orly airport rather than Charles de Gaulle. The only issue with flying AirBerlin is a long layover in Berlin. But you can turn that into an advantage. Just choose the earliest morning flight and stay in Berlin for 24 hours. It’s a great opportunity to see some of the city. You’re saving enough in taxes and fees to pay for a hotel, and there’s plenty to see and do. It’s like a free mini-vacation. Below is the final itinerary. You are still paying around $100 in taxes and fees, but that’s better than the $200 to $700 the other options cost. And, most importantly, you’re saving 20,000 miles by flying off-peak.